There are few things better than a hefty cookbook that’s alight with possibilities. One of the best I’ve ever come across is Phaidon’s I Know How to Cook by Ginette Mathiot. This bible of tradition French home cooking is one of those treasured books that you will continually go back to no matter what the trend or star chef of the moment. The only drawback? It’s going to take up some room on your cookbook shelf. But trust me when I say it is damn worth it! The recipes – Despite being a French cookbook, somehow Mathiot has made the recipes accessible,with most of the recipes containing only a handful ingredients and steps. It’s amazing how short the directions are – often just one small paragraph. For French food, no less! Nothing too complicated, yet there are indeed fancy dishes to be found. You can impress your guests without having to spend all day in the kitchen – finally! The design – The subject pages are colourful and fun images of food, but the photos are what’s going to excite you! Simple, clean photos showcase dishes such as Eggs with Truffles, Shoulder of Lamb Provencale and Four-berry Gelatin that will inspire you to create dishes that you have thought up until now, were completely beyond you. The recipes too are laid out spaciously so that you can whip up Creamy Coffee Mousse without feeling overwhelmed or have to squint your way through it. What I love most about the book is that I’ve always thought that you had to be European or classically-trained or damned patient and have all day to cook French food well. It turns out that all you really need is a passion for food and cooking and this book, which now resides proudly in my cookbook collection. I plan on working my way through these classic dishes in the next couple of years. In fact, I’m going to try for doing one a week. Why don’t you join me? I know that we can do it – thank to the lovely Ginette Mathiot and this truly extraordinary book. I remember driving on the highway through snow covered forests until we reached our chalet by the slopes. We didn’t waste any time – it was straight to the lift for us. After a long day skiing, there was nothing better than returning to our temporary home in the snow and sipping spiced apple cider then eating chili that had been heating all day in the slow cooker. Okay, I made all that up. I have only gone downhill skiing once in my life, and I was a train wreck. I don’t think I’ve ever set foot in a ski chalet, But if you, unlike me, are someone who hits the slopes all winter, The Ski Country Cookbook has been created just for you. 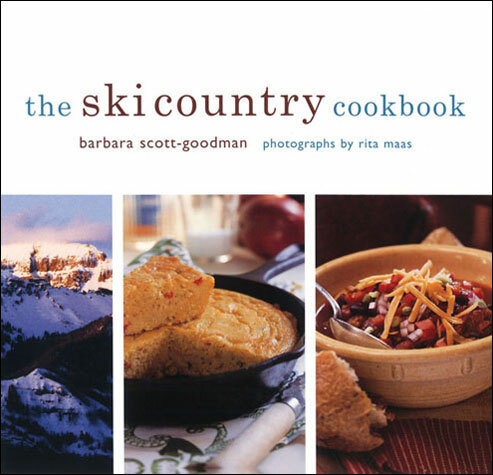 “The combination of cold mountain air and vigorous activity naturally makes us crave warm and restorative food,” says the Barbara Scott-Goodman in the introduction. But I think this book is for me, too. I mean, a brisk walk in the city will make me want warm and restorative food. Heck, just sitting here writing this makes me want a good, hearty meal. Besides, Scott-Goodman is from New York, so she knows that her recipes are going to appeal to people who don’t even live near mountains. So I’m going to ignore the gimmick and consider this a “Best of Winter” cookbook. There are classics like Corn Chowder, Baked Ham, and three different kinds of Chili. There are a couple of new things I want to try, such as Stir-fried Coleslaw and Wild Mushroom, Chicken and Orzo Soup. And all times of day are covered, including a section on cocktails and warm drinks. Mulled Pinot Noir and Brandy sounds good from my house in the city, but perhaps it’ s extra-special on the side of a mountain. I’m going to skip the Rum Raisin Cider, though. I’m not a raisin fan, so I’ll thank you to leave it out of my drinks. The photography depicts dishes in the book, but also idyllic chalets, buried to the rafters in snow. As long as I could get out to get my groceries, I think that would be a pretty fine way to spend the winter. Just don’t ask me to go skiing.